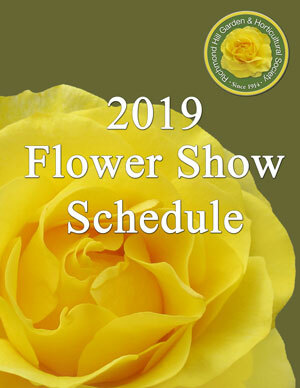 Our six annual Shows include classes for flowers, plants, fruit, vegetables, floral designs and special exhibits. Detailed Show information is a major part of our annual Yearbook, and is also available in a PDF format by clicking here. The Society has a long history of arranging these events to educate its members, to stimulate interest in horticulture and to provide an opportunity for creative expression. Winners in the various sections accumulate points over the growing season and are rewarded with beautiful trophies at our Annual General Meeting in January. Several of our trophies have long-standing connections with prominent members of our community. Flower Show judges are accredited by the Ontario Horticultural Association and all decisions are based on guidelines published in its Ontario Judging and Exhibiting Standards for Horticulture and Floral Design. Our members are encouraged to participate in this unique opportunity to showcase their gardening skills and floral design talents.